Here is a list of the most informative books on Howard Thurston. You can find them occasionally on www.eBay.com or through magic auctions. The original documents (i.e. manuscripts, photos, letters, etc.) for most of the below published books and magazines are in the Rory Feldman Collection, as explained below. Some of the original documents from these books and magazines will be displayed on www.ThurstonMasterMagician.com so check back often! Thanks! For more great magic related items CLICK HERE! The exact Full Length Turban Poster from 1907 depicted on the lower right hand corner of page 31 is in the Rory Feldman Collection. 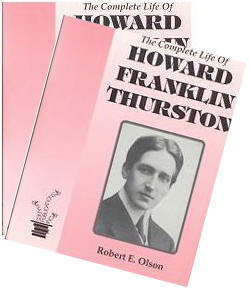 In this book there is lots of great information on Howard Thurston and he also appears on the cover! 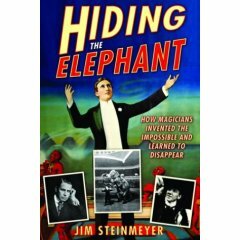 In this book there is a lot of great information on Howard Thurston, like how he performed the Rising Card Trick to Herrmann. The apparatus actually used by Howard Thurston for that magic trick is in the Rory Feldman Collection. www.ThurstonMaster-Magician.com, Rory Feldman, And The Columbus Landmarks Foundation's Efforts To Raise Money For The Green Lawn Abbey Are Mentioned In A 6 Page Article Written By Robin Smith, In The August 2006 Issue Of The Linking Ring Magazine, The Magazine For Members Of The International Brotherhood Of Magicians. A 5 Page Article About Rory Feldman Titled "The Brooklyn Wonder Show" Written By Richard Lane, Is In The September 2006 Issue Of M-U-M Magazine, The Magazine For Members Of The Society Of American Magicians. This Article Covers Rory Feldman's Life In Magic As A Magician And Magic Collector, His Goals And Aspirations.